Dana is a singer, dancer, actress, model from a suburb of Chicago. At age 3 Dana began taking dance classes at The Academy of Dance Arts, and her passion for the arts hasn't slowed since. She grew up watching her Aunt perform and musical direct, and always aspired to follow in similar footsteps. Dana's family is ecstatic to finally have a performer, as her three older sisters went the athletics route. 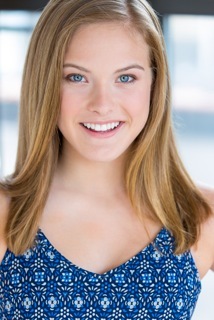 After portraying the role of "Louisa" in The Sound of Music at Drury Lane in Oakbrook, Dana decided that she would make a career based upon performing. An active student at Naperville North High school, Dana was in all four of her musicals, Dance Team, a Captain of her Mixed Showchoir, President of her choir, leader of mentoring programs for underclassmen, and an honors student. Dana is hardworking, driven, and loves being busy and involved in as much as possible. In the Fall of 2015, Dana will be studying Music Education and Theatre at Elmhurst College. She is excited to explore this next chapter, especially because she will be close to Chicago where the opportunities are endless. Dana is beyond grateful for the opportunities from Gray Talent Group, and looks forward to the future opportunities and challenges.